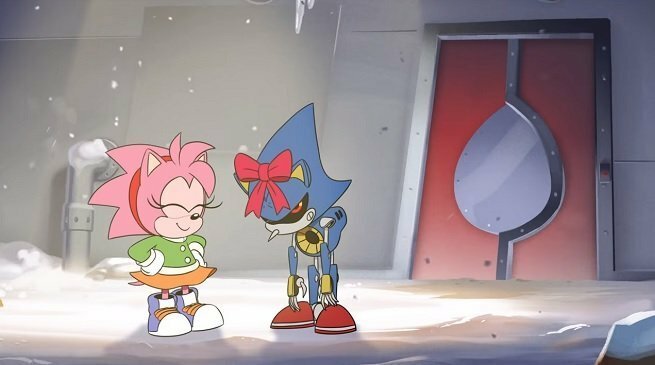 It’s insane how much nostalgia and emotion these guys can pack into a 3-minute episode, but here we are, feeling sorry for a metallic robot hedgehog. Metal Sonic and Eggman have both been bested by Sonic and the crew, and while Eggman is his usual grump self, the defeat really does seem to zap Metal Sonic of all ambition and self-worth. He’s content to lay there in his own self-loathing until he rusts away. But then Amy shows up! Seeing Amy was a big surprise for fans, and she truly is the star of the show. She sees Metal Sonic is suffering (after a few initially-panicked wallops with her hammer), and decides to help him. She makes sure that he makes it safely back to Eggman’s lab, where he can be repaired and put to good use once again. It’s so heartwarming, and we have no idea why. I can’t believe I’m saying this, but if you want some more heartwarming, warm-and-fuzzy feelings, you should go check out the comments section for the video on YouTube. Usually I’d recommend staying far away from YouTube’s comment section, but here fans are simply thankful for this little cartoon and for the chance to see Amy. We hope you love it.